Arrive Delhi by International flight. Meeting and assistance upon arrival and transfer to the hotel. Overnight at the hotel. Today morning after breakfast, drive to Agra (approx. 210kms / 04hours). Upon arrival at Agra, check - in at the hotel. Afternoon is free to explore the crowded and colorful lanes of city’s local bazaars. Overnight at the hotel. After breakfast, start sightseeing tour of Agra city visiting the impressive Agra Fort, the local bazaar and of course, the most perfect architectural monument in the world - The Taj Mahal (Closed on Fridays) - one of the seven wonders of the world, this beautiful mausoleum in pure white marble, took 22 years and 22,000 craftsmen to build it. This monument was built by Emperor Shah Jahan in the memory of his beloved consort Mumtaz Mahal. In evening transfer to the railway station to board train for Varanasi. Overnight on the board. Early morning arrival in Varanasi and witness sunrise over Ganges by boat ride when hundreds of people are worshiping and taking bath later transfer to the hotel for check-in. Varanasi situated on the banks of the sacred Ganges, Varanasi has been a center of pilgrimage and learning for over 2000 years and is considered to be one of the oldest surviving cities in the world. Post breakfast proceed for a panoramic city sightseeing tour of Varanasi including tour to Sarnath, the site of Lord Buddha's first sermon after attaining enlightenment. At Sarnath we meet many Buddhist monks and followers before visiting local homes to see in-home silk weaving and soak up some local customs, culture and hospitality. Evening witness Aarti ceremony at Ghats. Overnight at the hotel. Morning after breakfast, tour the old city visiting the principles temples including Kashi Hindu University where more than fifty thousand students from all over the world are learning and later visit Gyanvapi Mosque and Benaras Hindu University. Rest of the day is free to enjoy local bazaar (Optional) by own or for individual activities. After breakfast proceed to Bodhgaya by surface (approx. 260kms / 06hours). Bodhgaya is one of the sacred places for the Buddhists as well as for the Hindus. Here under the Bodhi Tree, Gautama attained supreme knowledge to become Buddha, the 'Enlighted One'. Lord Buddha the gentle colossus, who founded the first universal religion of the world, worked and lived much of his life in Bihar though he was born in Kapilavastu, now in Nepal. Most of the major events of his life, like enlightenment and last sermon happened in Bihar. Significantly the state's name originated from 'Vihara' meaning Buddhist and Jain monasteries, which abounded in Bihar. The Buddha attained enlightenment in Bodhgaya, under the Bodhi tree, 10 km from Gaya the ancient Hindu pilgrimage center. The tree from the original sapling still stands in the temple premises. It is the most important Buddhist pilgrimage center as Buddhism was born here. The magnificent Mahabodhi temple in Bodhgaya is an architectural amalgamation of many centuries’ cultures and many heritages that came to pay their homage here. The temple definitely has architecture of the Gupta and later ages, inscriptions describing visits of pilgrims from Sri Lanka, Myanmar and China between 7th and 10th century AD. It is perhaps still the same temple Hiuen Tsang visited in 7th century. Overnight at the hotel. This morning after breakfast at the hotel and proceed to visit temples in Bodhgaya - Mahabodhi Temple, Animesh Locan Chaiyata, Mohanta's Monastery, Thai Temple and The Burmese Temple. Later visit Monuments such as - Tibetan Monastery, International Buddhist House, Buddhist Monastery of Bhutan, The Chinese Temple & Monastery and Bodhi Tree. Also visit Archaeological Museum. Evening is free for leisure walks around the surrounding area. Overnight at the hotel. After breakfast proceed to Patna by surface (approx. 160kms / 05hours) en-route visiting the historical towns of Nalanda & Rajgir. NALANDA: Nalanda, where ruins of the great ancient university have been excavated, is situated at a distance of 90 Kms south east of Patna by road. It falls on way to Rajgir. Nalanda has a very ancient history. It was frequently visited by Lord Vardhamana Mahavir and Lord Buddha in the 6th century BC during his sajourns, the Lord Buddha found this place prosperous, swelling, and teeming with population and containing mango-groves. It is also supposed to be the birth place of Sariputra, one of the Chief disciples of the Lord Buddha. RAJGIR: The Buddha lived in the sixth century BC. Mahavir was born in 567 BC and the traveller in Bihar will encounter them both constantly. Rajgir is 10km south of Nalanda and sacred to the memory of the founder of both Buddhism and Jainism. Lord Buddha spent many months of retreat during the rainy season here, and used to meditate and preach on Griddhkuta, the 'Hill of the Vultures'. Lord Mahavir spent fourteen years of his life at Rajgir and Nalanda. It was in Rajgriha that Lord Buddha delivered some of his famous sermons and converted king Bimbisara of the Magasha Kingdom and countless others to his creed. Once a great city, Rajgir is just a village today, but vestiges of a legendary and historical past remain, like the cyclopean wall that encircles the town and the marks engraved in rock that local folklore ascribes to Lord Krishna's chariot. This legend, like many others associates Rajgir to that distant time when the stirring events recorded in the epic Mahabharata were being enacted. Rajgir is located in a verdant valley surrounded by rocky hills. An aerial ropeway provides the link with a hill-top stupa "Peace Pagoda" built by the Japanese. On one of the hills in the cave of Saptparni, was held the first Buddhist Council. The Saptparni cave is also the source of the Rajgir Hot Water Springs that have curative properties and are sacred to the Hindus. Patna, the capital city of Bihar, is a historical city, which has like Delhi, experienced the trauma and pain of being conquered. The heritage of Patna or Pataliputra as it was known goes back to two millennia. This city was the seat of administration for many rulers and each of them ascended with a new name for their capital. Evening is free for individual activities or relaxation. Overnight at the hotel. After breakfast proceed to Kushinagar by surface (approx. 255kms / 06hours) en route visiting Vaishali which is located 55kms from Patna and holds special significance for Buddhist devotees. It was here that the Buddha announced the approaching of his Mahaparinirvana. Visit Ashokan Pillar - the magnificent Ashokan pillar with a lion adorning its top is a definite crowd-puller. This 18.3 m high pillar is made of a single piece of red sandstone and is a major attraction to the tourists. Upon arrival, transfer to the hotel for Check-in. KUSHINAGAR: The Buddha is believed to have breathed his last in this land with pastoral surrounding, the small hamlet of Kushinagar, 53kms west of Gorakhpur. The land is venerated as the site of the Buddha's Mahaparinirvana, his death and cremation that marked his final liberation from the cycles of death and rebirth. This small town in the former kingdom of the Mallas was surrounded by dense forest. It remained oblivious to the outside world until it was rediscovered by the archaeologists in the nineteenth century. 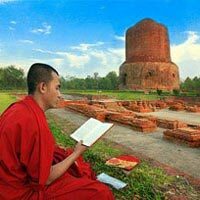 The modern Indo-Japan-Sri Lanka Buddhist center, Kushinagar is rediscovering its roots, and is home to many viharas, including a Tibetan Gompa devoted to Sakyamuni, a Burmese vihara, and temples from China and Japan. After breakfast proceed to Lumbini by surface (approx. 165kms / 05hours). Upon arrival, transfer to the hotel for Check-in. Later proceed for sightseeing tour of Lumbini which is the birthplace of the Gautama Buddha, Lumbini, is the Mecca of every Buddhist, being one of the four holy places of Buddhism. Buddha himself identified four places of future pilgrimage: the sites of his birth, enlightenment, first discourse, and death. Hence the birth of Gautam Buddha makes it one of the most sacred places in the world. The Sal tree where Siddhartha was born is difficult to locate now. But Ashoka, in the 21st year of his reign visited the forest and raised a pillar on the spot where Siddhartha was born. The Mayadevi Temple: This Mayadevi temple dedicated to the mother of the Buddha has been digged out and restored. The temple has a stone artifact depicting the nativity of the Buddha. Maya Devi, his mother, gave birth to the child on her way to her parent's home in Devadaha while taking rest in Lumbini under a Sal tree in the month of May in the year 642 BC. 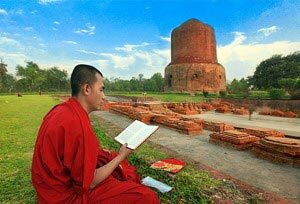 The beauty of Lumbini is described in Pali and Sanskrit literature. Maya Devi: it is said was spellbound to see the natural splendor of Lumbini. While she was standing, she felt labor pains and catching hold of a drooping branch of a Sal tree, the baby, the future Buddha, was born. Today after breakfast, the best way to experience this holy place is to take a leisurely walk and spend time in and around this area. Overnight at the hotel. Today after breakfast proceed to Sravasti by surface (approx. 225kms / 06hours). Upon arrival, transfer to the hotel for Check-in. Later visit to Sahet & Mahet -15kms from Balrampur and the capital of the ancient Kingdom of Kosala. Sravasti has the honour for sheltering Buddha for 24 rainy seasons in the Jetvana Vihar and has the famous Anand Bodhi tree, age-old stupas, majestic monasteries and several temples. Buddha is said to have performed some miracles here. This morning after breakfast proceed to Lucknow Railway Station by surface (approx. 175kms / 05hours) to board afternoon train for Delhi (Shatabdi Express 1535/2215hours). Upon arrival, transfer to the hotel for Check-in. Overnight at the hotel. This morning after breakfast, day is free for individual activities or shopping. In night transfer to the International airport to board flight for onward destination.